Danzig, surroondit bi Germany an Poland. 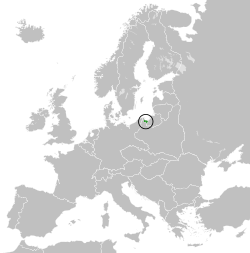 Location o the Free Ceety o Danzig in 1930 Europe. The Free Ceety o Danzig (German: Freie Stadt Danzig; Pols: Wolne Miasto Gdańsk) wis a semi-autonomous ceety-state that existit atween 1920 an 1939, consistin o the Baltic Sea port o Danzig (nou Gdańsk, Poland) an nearly 200 touns in the surroondin auries. This page wis last eeditit on 29 August 2015, at 15:01.